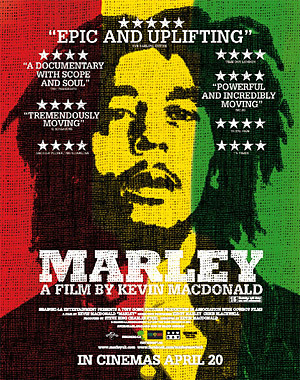 Marley (Director: Kevin Macdonald): While waiting in line before the Hot Docs screening of the Bob Marley bio doc Marley, it occurred to me how little I knew about the man, despite his iconic status and my having listened to his music for about 20 years. My lack of knowledge really became apparent just five minutes into the film, when I learned that Marley’s dad was a white Englishman. I was completely floored and somewhat embarrassed at not having known this, especially considering my own similarities to his background, as my father is also British and my mother is Jamaican (an informal poll of friends and family afterwards indicated the “white father” detail was news to almost all of them as well). That there’s never been a notable feature-length documentary on the reggae superstar until now is hard to believe, although that’s mostly due to the tight reins that his estate keeps on the protection of his legacy. That all changes with Marley. His family were fully involved in its creation (son Ziggy is an executive producer), from giving interviews, granting director Kevin Macdonald carte blanche to Marley’s catalogue, opening up the musician’s archives, and enabling access to the most important people from Marley’s life who are still alive. Macdonald, who’s probably best known for directing The Last King of Scotland, makes the most of a lengthy 145 minute running time, constructing an intimate portrait of the reggae superstar that moves briskly. Marley’s impoverished childhood in Trench Town, a development in the community of Jamaica’s capital, Kingston, is brought to life with an abundant number of archival photos, vibrant modern-day shots that juxtapose the island’s lush beauty with its abject poverty, and remembrances from his family and boyhood friends. A charismatic Neville Livingston (aka Bunny Wailer) recalls a youthful Marley’s struggle to fit in due to his lighter skin colour and entertains with stories detailing some early musical experiences the pair shared in the 60s, up until Livingston’s departure from The Wailers, Marley’s band, in 1973. Many other musical associates of Marley weigh in, including a number of former band members, Wailers artistic director Neville Garrick, and Chris Blackwell, who signed Marley to his Island Records label and opened up a worldwide audience to the musician. Rita Marley, his widow and a backup singer in his band, shares her feelings on their life together and her husband’s much-discussed womanizing, which she basically just tolerated while looking the other way (Marley fathered 11 children with seven different women). Two of those children, Ziggy and daughter Cedella, are interviewed and paint the picture of a loving dad who was also distant. The film also covers Marley’s devout Rastafarian faith, his role as a uniting force within Jamaican and African politics, the 1976 attempt on his life, Marley’s temporary exile to London in the 70s, and his last days before succumbing to cancer in 1981 at the age of 36. Macdonald doesn’t break the music documentary mold with Marley, adhering to the standard structures of the genre. It’s the director’s unprecedented access to such a wealth of previously untapped resources, and his judicious use of them, that elevate this film to something truly special. More than 60 people were interviewed for the project and as informative as the contributions are from Marley’s fellow musicians, it’s the interviews with less obvious figures, such as Peter Marley (his white second cousin), Constance Marley (his half sister), Dudley Sibley (a recording artist and studio janitor who lived with Marley for a couple of years), and Cindy Breakspeare (Miss World 1976 and one of Marley’s mistresses) that notably help to humanize someone whose persona has taken on legendary proportions. Add in that obviously great musical catalogue from which to draw and Marley emerges as a veritable treasure trove for fans, as well as an important document of one of the 20th century’s most significant musical figures. This entry was posted in Documentaries, Film Festivals, Hot Docs and tagged #hotdocs12, jamaica, music, reggae. Bookmark the permalink.